A Control Mark is the State supervision Mark. A Control Mark means, that the precious metal’s content is analyzed, and confirms the precious metal article’s correspondence to the standard Fineness Mark. The control mark is the “surveillance mark of fineness marks” in Estonia. The image of the control mark is a facing and stepping lion in an oval hollow.. The Control Mark of Estonia is affixed to an article of precious metal only by accredited laboratory of Estonian Assay Office of Metrosert Ltd, which has the exclusive rights for Hallmarking in Estonia. Convention on the Control and Marking of Articles of Precious Metals (also known under “Hallmarking Convention” or “Vienna Convention”) “Common Control Mark” (CCM) www.hallmarkingconvention.org. 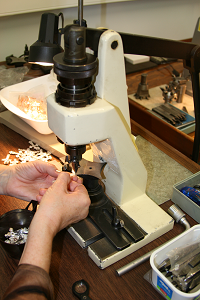 The Precious Metals articles Hallmarking normally is hold mechanical. 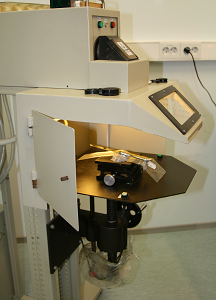 If the mechanical marking is not possible Laser marking is in use. The Laser marking is ideal for marking hollow or thin articles, flat and curved surfaces and when minimum finishing of an item is required.